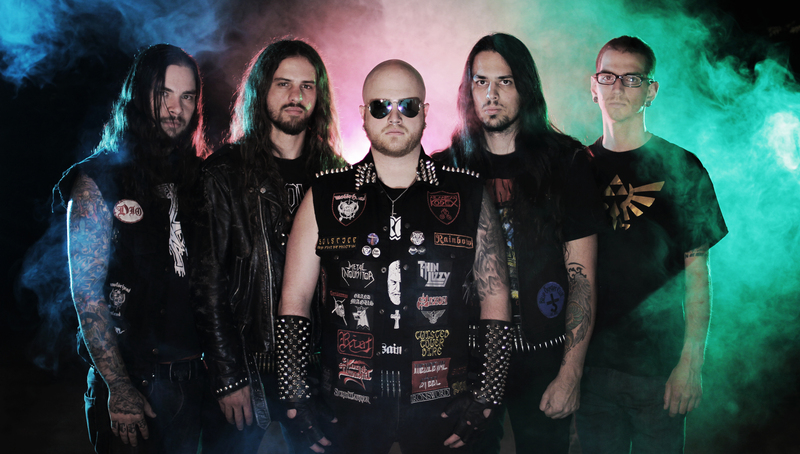 So, Visigoth turns out to be the first band featured twice with an interview here at Metal Squadron. As we go into our second year of existence, I guess it’s just natural that a few acts that we have featured before, pops up again. While the band had just released the cool EP “The Final Spell”,when we last featured them, they’ve now taken a step further and is ready to unleash their first full length releases onto the masses. 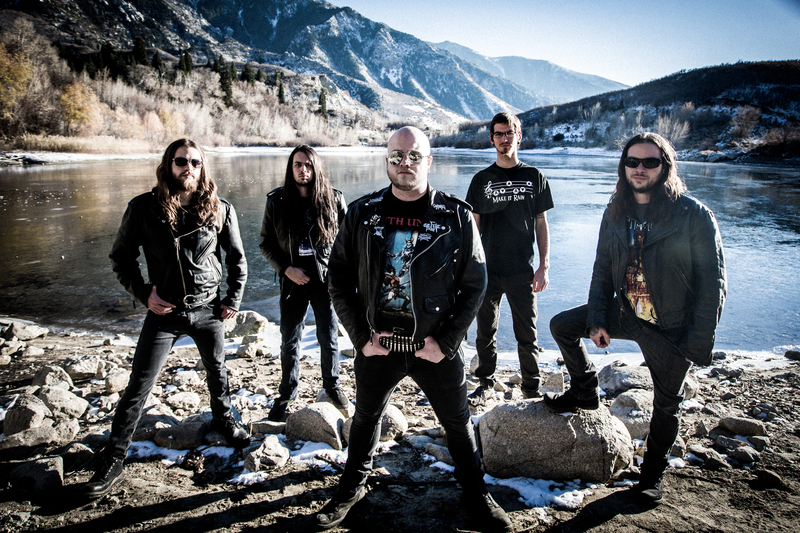 We hooked up with singer Jake Rogers to get all the essential details on Visigoth’s Metal Blade debut. Enjoy! You started the studio work for “The Revenant King” already in November 2013. When you finished recording a year ago, I guess the time until the album is released gives you time to reflect on the finished product. Are you still as enthusiastic about the album as you were when you left the studio about a year ago, or have thoughts about things you would’ve liked to change already come creeping? – There are, of course, elements of the album that we aren’t happy with. The only thing we can do is look forward and improve on these things with our next record! Around the release of “Final Spell”, you told me you were aiming for a sound somewhere between the demo and the EP for the first full length. Do you think you have achieved it? – To an extent, we did. It sounds less polished than the “Final Spell” EP, which is something that was important to me. It has a more stripped-down sound with a pure tube guitar sound, but it is not as rough and amateur as our first demo was. We’re still very much finding our sound, so we have yet to hone in on precisely how we want everything to sound. The songs on “Final Spell” were very melodic, clean and accessible, while “The Revenant King” sounds a bit darker and heavier. Does the new album feel more like taking a step backwards (it also includes two rerecorded demo songs) than a step forward? – It feels like a big step forward. I personally prefer bands with a darker, more serious sound, and I was very happy to move away from the shinier sound of the EP and into a heavier, more natural production. Heavy metal music is best when you can hear the human element, and “The Revenant King” was a step toward capturing the human element while maintaining a large and heavy sound. Was the fact that the demo versions of “Iron Brotherhood” and “Vengeance” were more or less bedroom recordings, enough to motivate you to record them again, or did you also feel a need to change the songs a bit too make the task of recording them again interesting? – We did change them a bit because there were things about the original recordings that always bothered us. In the past you did a cover of Omen’s “Battle Cry” and on this album you have done a version of Manilla Road’s “Necropolis”. Since both songs have been covered by numerous acts already, I guess you choose which songs to cover from other criteria than how many times they have been covered by other artists? – Haha, yes, they have both been covered aptly in the past. We have no pretention about the songs we choose – we pick covers that the crowd has a blast headbanging to and singing along to in a live setting! “Necropolis” is one of those songs that always gets the crowd raging, and it also has the benefit of paying homage to one of our favourite bands of all time – Manilla Road! They were the first band that I collected a complete discography from, and I even have gotten all of my Manilla Road LPs signed. They have been incredibly important to me ever since I discovered them in high school, and including a recording of the cover was an opportunity to pay homage and kneel at the altar of the ‘Road! I would have loved to have delved deeper into the more cobweb-strewn corners of the Manilla Road cellar, but in our area, ‘Necropolis’ is really the only song that enough people knew well enough to be involved with. I like to have the audience help sing our cover songs when we play them live, and this was the Manilla Road song that provided the most opportunity for that sort of live interation. On “A Revenant King”, all of your own compositions range from five up to ten minutes. The songs are generally longer than on the EP, more diverse and the arrangements more ambitious. Since you play a form of metal with based on a traditional sound with pretty strict “rules” for what is accepted or not, was this something that you did to challenge yourselves? – No, actually. We didn’t really give ourselves ‘rules’ – we just tend to write songs that are a bit on the longer side, apparently. We’ve gotten quite a few comments on the lengths of the tracks on the album, which honestly to me is a bit odd because metal commonly works with longer arrangements and with the exception of ‘From the Arcane Mists of Prophecy’, the songs don’t seem abnormally long to me. But I guess coming from, say, the standpoint of NWOBHM where songs tend to stay within the 3-5 minute marks, they could be considered lengthy. Either way, it’s just naturally the way we wrote the songs. We never went into things saying “alright, this song is going to be 9 minutes long”; that’s just the way they worked out. Referring again to the last interview we did for Metal Squadron, you said back then that you wouldn’t rerecord any of the songs from the EP. Still, you have included “Creature Of Desire”. What made you change your mind? Do you feel that the song becomes a “different” in a new context, as it not the opener here, but rather one of the songs towards the end? – Actually, the record label specifically requested that we re-record some older songs, which occurred after we did the first interview, otherwise we likely wouldn’t have done so. And yes, some of the older songs may seem a bit out of place in that sense, but this is our first album so I suppose it is to be expected that the songs differ in style from one another since it is sort of an amalgam of our first four years as a band. To be able to perform live was one of the main reasons why Visigoth formed, and something you have focused on during the early career and up until now. How does a concert with Visigoth nowadays compare to the earliest shows you did? – We are tighter and more experienced now. We still have a lot to learn, but we have solidified a stronger foundation for live techniques than we had at the beginning. During the last year you have played alongside acts King Diamond and Raven. What can a new band like yourself learn from artists that have been part of this for as long as these two have? – There is so much to learn! I would first like to point out that the members of both King Diamond and Raven were excellent guys who were very kind and down-to-earth, which was an awesome experience for us as a young band and, more importantly, heavy metal fans. We’re always keen on observing what it is that makes these classic performances so sonically and visually engaging. It’s really an incredible honour having the opportunity to see and play with bands like this. You had some problems with his larynx last year. Is this a result of the quite extensive gigging you have been doing locally? How is he doing now? Is this a problem that could return? – No, it actually turns out that I have severe acid reflux. I am still working on mending my larynx. I have started on medication and have been completely revamping my diet in order to mitigate the effects of the GERD. So it is a problem that could return, but hopefully with dedication and treatment I’ll have the issue completely under control by the time we start touring in the spring. How important is the lyrics for a band like Visigoth? Are they written to already existing music, or do the lyrics sometime come first? How closely connected is the music and the lyrics? – Lyrics are of course important, but writing them is my least favourite aspect being in a band. The lyrics always come last – we write the music first, then I write vocal lines and melodies, and once everything else is complete, I come up with lyrics to fit everything. The music ties into the lyrics pretty closely in that I try to fit the themes of the lyrics with the feeling of the riffs in each particular song. That being said, I don’t enjoy writing lyrics, and it is definitely the biggest struggle for me as a musician. As the fantasy element seems to be quite strong in your lyrics, do you see your songs as some sort of escapism , both for yourself as well as for your fans? Something like reading a good book or watching a movie? – Escapism is most definitely part of the equation. Equating listening to music to reading a book or watching a movie like you did is an excellent parallel in my opinion – many of my favourite bands really create worlds with their sound, atmosphere, and/or lyrics. I love albums that take me away from the real world and immerse me in something fantastic. The fantasy themes in the lyrics I write are partially drawn from a desire for escapism and partially from the love I’ve had for fantasy stories and imagery since I was a child. The Hobbit and The Lord of the Rings are the first real novels I remember reading when I was very, very young, and since then I was always reading fantasy books and video games, and then in high school I played a lot of tabletop roleplaying games as well. All of these elements contribute to the fantasy aspect of Visigoth’s lyrical and aesthetic content. In the interview I referred to earlier, you also said: “Also keep in mind we are living in Salt Lake City, Utah, a widely stereotyped place and also a very musically isolated place”. How would you describe trying to establish a band in an environment like this? – It actually wasn’t difficult. Once we started playing shows, we pretty quickly fell in with all the other headbangers in the area. Salt Lake City’s metal scene is very small and dominated primarily by black, death, and thrash metal. I don’t count deathcore, metalcore, “groove metal”, or any of those types of music as metal so I’m not considering them here even though we have a lot of those types of bands. I think the other metal bands in the valley thought it was cool to have a more traditional-style heavy metal band in the fold. We play a lot of shows with black and death metal bands as a result, haha. It’s a lot of fun for me because I also love these genres. Works out for everybody! I kind of expected your debut album to be released by Cruz Del Sur, however you opted for Metal Blade in the end. Many bands seem to Place emphasis on the history of Metal Blade when they choose to work for them. Was this important for you as well? – Yes, it definitely played a factor. This is label that released incredible classics such as Battle Cry by Omen, Tales of Terror by Hallow’s Eve, Deliver Us by Warlord, Court in the Act by Satan, War and Pain by Voivod, Haunting the Chapel by Slayer, as well as introducing Hellhammer, Celtic Frost, and Sodom to North American audiences. There are tons of other killer records that were released by Metal Blade in the 80s but I won’t sit here and list it all for the sake of space. We are now currently labelmates with mighty acts such as King Diamond, Desaster, Bolt Thrower, Primordial, The Lord Weird Slough Feg, Artillery, and a huge slew of other great metal bands. It’s exciting and, to be honest, a little bewildering to be among such prestigious company. We never expected to be on a label this big so it is taking some getting used to for us, haha. At the same time, many of the traditional metal acts that end up on the bigger labels like Nuclear Blast, Century Media or Metal Blade, seem to have a rather short lived career working with these companies. Do you have an agreement in place for more albums, or is it dependant on how “The Revenant King” does? As a band, do you have the same type of “impatience” as the bigger labels often have, and want results fast, or do you see the band as more of a long term project? – We actually do have a multiple-album deal with them. We are not a “fast results” band at all. We think very much in the long term. The fact that we aren’t impatient doesn’t mean we’re not hungry, though – we will be on the road as much as possible in the coming year. We just have some personal and financial hurdles to get behind us in the coming months before the touring regimen begins. This entry was posted in Long Distance Runners and tagged Cruz Del Sur, Jake Rogers, Manilla Road, The Revenant King, Visigoth by leifkringen. Bookmark the permalink.